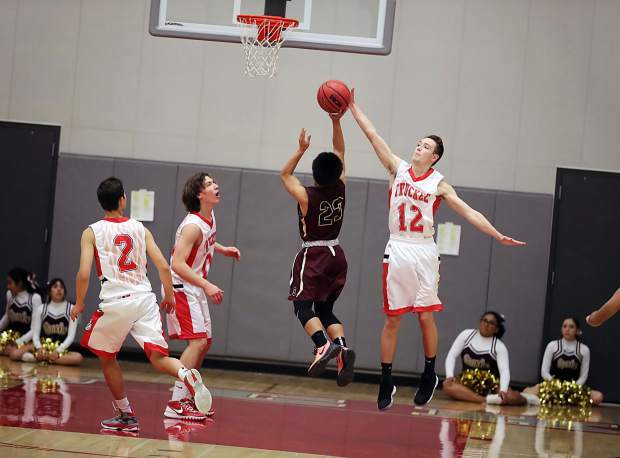 The Truckee Wolverines boys’ basketball team opened play in the Class 3A Northern League on Tuesday, Dec. 5, and cruised to a 65-28 win at home over Sparks. Truckee got off to a slow start on the night, but soon found a rhythm offensively, and raced away from the Railroaders. Senior Gabriel Cruz had his best scoring performance of the season thus far, leading the Wolverines with 16 points on the night. Fellow senior Froilan Gaitan also posted his best game of the season with 11 points. Senior Garrett Hamilton was next on the team with seven points, followed by junior Spencer Edmonson with six points, and junior Elliot Rost with five points. With such a large lead during the game, Head Coach Tom Cruz was able to mix in his bench players for extended minutes, resulting in nine players scoring on the night for Truckee. Over the course of four games, the Wolverines (3-1, 1-0 Northern League) have been able to spread things around offensively with three different players stepping up to lead the team in scoring. Truckee currently has four players averaging double figures in points, with another — Edmondson — at 9.3 points per game. The Wolverines will get a week off between contests, before traveling to South Tahoe on Tuesday, Dec. 12, for a league matchup against the Vikings. Truckee will then travel to face league foe Churchill County on Dec. 15. The team then returns home the following day against Lowry for their final league game before the Christmas break and a tournament in Vacaville, Calif.